Chris Read reached an historic milestone on a day of high emotion at Trent Bridge as Nottinghamshire pulled off an astonishing 52-run victory over Durham. The 37-year old became the first wicketkeeper since Jack Russell in 1997 to reach the landmark of 1,000 first class dismissals and his big moment came during a passage of play where Durham threw away their overall dominance in a contest that they had bossed since winning the toss. Set to score 215 to win, Durham had been well set at 57 for one before losing four wickets within the space of just 5.4 overs. One of those to depart was Paul Collingwood, who nicked through to the Nottinghamshire glove man to herald scenes of great jubilation, both on and off the field. Brett Hutton was the main thorn in the side of the batsmen, completing his second five-wicket aul within the space of 24 hours, in taking five for 29. Earlier, after beginning the day 30 runs adrift, Samit Patel and Riki Wessels gave the hosts a life-line with a fifth wicket stand of 153, before Wessels fell just before lunch for 85. 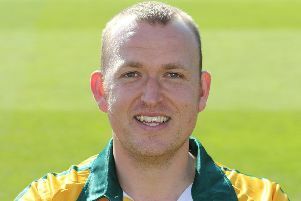 Ryan Pringle chipped away at the Nottinghamshire middle order, on his way to figures of three for 93 but Patel held firm, reaching his second century of the summer from 154 balls, having hit 12 fours and a six. Brett Hutton and Luke Wood, who followed his unbeaten first innings score of 65, with another 35, added a valuable 53 for the eighth wicket to stretch the lead beyond 200. Jack Burnham was bowled for a golden duck in the opening over of the chase, shouldering arms to Jake Ball. Harry Gurney removed Scott Borthwick and Michael Stoneman in his opening over to arrest Durham’s charge towards the finishing line and Hutton backed him with the wickets of Michael Richardson, Collingwood and Pringle. Ball returned to the attack to remove Jamie Harrison and Gordon Muchall, sufficient wounds for the umpires to accede to Read’s request for an extra half hour. Hutton quickly polished things off, with the scalps of Rushworh and Onions, to finish with match figures of 10 for 106. The victory was Nottinghamshire’s fourth in a row, the first time they have achieved that since 2010. Conversely, this was the seventh match that Durham have gone without a Championship win, six of those games having finished in a defeat.